Congratulations to Mrs. Reyna Adair, winner of the district's first ROCK'in My Ride window decal contest! 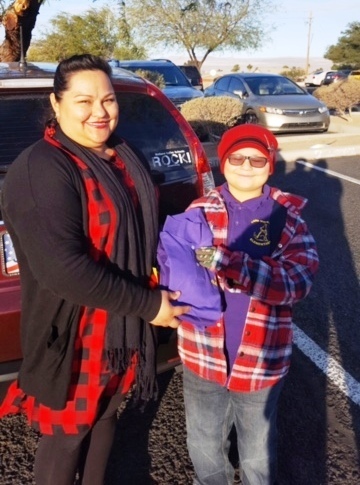 Mrs. Reyna along with son Jason won five school uniform shirts from Colorado River Tees. How do you win? It's simple: Download the Mohave Valley School District App through either the Google Play Store or the Apple Store. Then simply watch your newsfeed through the app. the website, or social media. If we spot your car with a ROCK! window we'll post a picture. Winners will have one week to show their mobile app and their vehicle with the ROCK! decal. School Secretaries still have decals, so if you don't have one yet, get yours tomorrow!